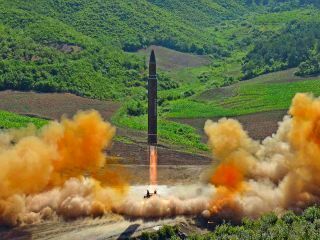 This photo distributed by the North Korean government shows the launch of an intercontinental ballistic missile (ICBM) in North Korea's northwest, Tuesday, July 4, 2017. Independent journalists were not given access to cover the event depicted in this photo. "The United States strongly condemns North Korea's launch of an intercontinental ballistic missile," U.S. Secretary of State Rex Tillerson said in a statement yesterday (July 4). "Testing an ICBM represents a new escalation of the threat to the United States, our allies and partners, the region, and the world." The available evidence suggests that the missile splashed down in the ocean about 590 miles (950 kilometers) from the launch site after flying for 37 minutes, said missile expert David Wright, a senior scientist at the Union of Concerned Scientists, a science advocacy group in Cambridge, Massachusetts. "A flight time of 37 minutes would require it to reach a maximum altitude of more than 2,800 km (1700 miles)," Wright wrote in a blog post yesterday. "So if the reports are correct, that same missile could reach a maximum range of roughly 6,700 km (4,160 miles) on a standard trajectory. That range would not be enough to reach the lower 48 states or the large islands of Hawaii, but would allow it to reach all of Alaska." Yesterday's test was therefore revelatory. It apparently involved a KN-17 missile, which Pyongyang has test-launched before, topped with a second stage to make "a brand-new missile that has not been seen before," CNN reported, citing U.S. officials. "The focus now is on the capability of that second stage, and how it technically contributed to making Pyongyang's latest test its first ever intercontinental ballistic missile (ICBM) launch," CNN wrote.